Egypt Opens Murder, Conspiracy Investigation Against Morsi : The Two-Way The charges against the ousted Egyptian leader stem from his 2011 escape from prison in the final days of the Hosni Mubarak regime. Egyptian prosecutors have opened an investigation into ousted President Mohammed Morsi, who they suspect of conspiracy and murder, raising tensions as both Islamists and supporters of newly installed military chief Gen. Abdel-Fattah el-Sissi turn out for street protests. The surprise announcement of the investigation against Morsi, who was removed in a July 3 coup, stem from a 2011 prison break in which Morsi escaped and at least 14 guards were killed. Hamas gunmen are said to have led the attack at Wadi el-Natroun prison, an allegation the militant group has denied. Judge Hassan Samir said Morsi conspired with Hamas to carry out "aggressive acts in the country." Morsi was among about 30 members of the Muslim Brotherhood who broke out of prison in the final days of the regime of President Hosni Mubarak, who was forced to step down in February 2011. 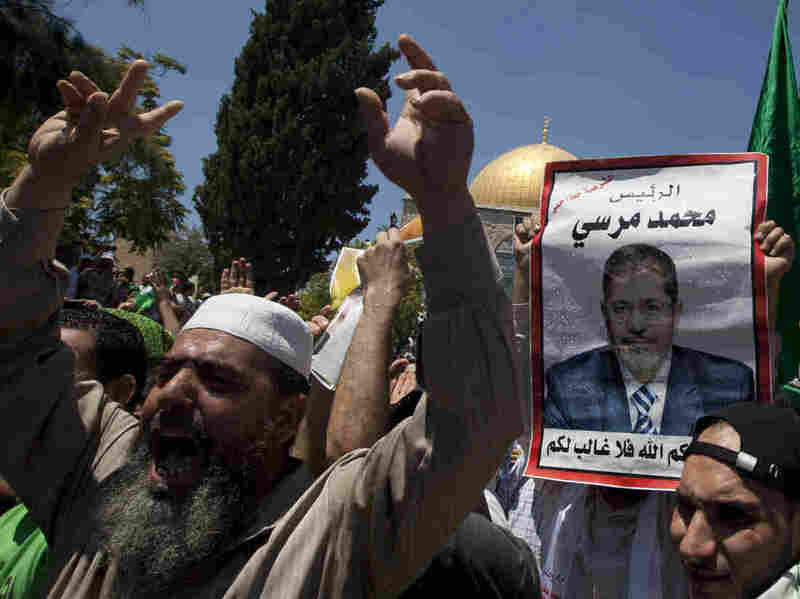 The allegations against Morsi are seen by his supporters as politically motivated. NPR's Cairo bureau chief, Leila Fadel, tells Morning Edition there's been huge international pressure to release Morsi and that the allegations announced Friday are "the first legal reason given" for his continued detention. El-Sissi called on his supporters to turn out in street protests Friday in what he's described as a "war against terrorism" against Islamists. "Morsi's Islamist backers, in turn, were packing their own rallies in Cairo and elsewhere Friday in what they called the day 'to bring down the coup,' referring to el-Sissi's July 3 deposing of Morsi, Egypt's first freely elected president." Fadel says: "There's a real fear that this will go from rival protests today to a serious crackdown in the coming days from the security forces." An earlier version of this post said Morsi had been formally charged. Instead, the Egyptian government has opened an investigation into allegations of murder and conspiracy. Formal charges may follow. NPR's Soraya Sarhaddi Nelson, reporting from Cairo says that at least five people have been killed and more than 200 injured in clashes between supporters of Morsi and el-Sissi. She says some of the worst clashes were in the northern city of Alexandria, where video taken by the Muslim Brotherhood showed el-Sissi supporters flinging rocks at pro-Morsi demonstrators. "[Muslim] Brotherhood officials accused security forces in Alexandria of aiding those carrying out the attacks, a charge security leaders denied," Soraya says.